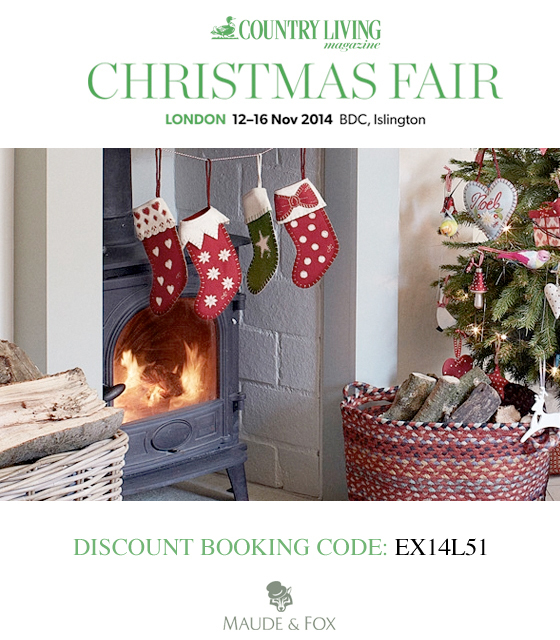 London’s Country Living Christmas Fair takes place next month in Islington. It promises to a fab show where you’ll be able to pick up unique gifts along with inspired ideas and decorations to bring that magical Christmas sparkle to your home. Maude & Fox have a stand at the show so you’ll also be able to pick up the ultimate in contemporary tweed clothing, guaranteed to put the biggest of smiles on lucky faces come Christmas morning. Of course, once you try on an item of tweed clothing from Maude & Fox (such as our Tweed Nosy Parka) you can be forgiven for getting a present for yourself. A new tweed winter coat perhaps? The Country Living Christmas Fair will be taking place from Wednesday 12th to Sunday 16th November at the Business Design Centre, Islington. Get a discounted to this event ticket by quoting reference EX14L51. You can redeem this code online here or by calling 0844 848 0150. Just be sure to visit us on Stand T2! 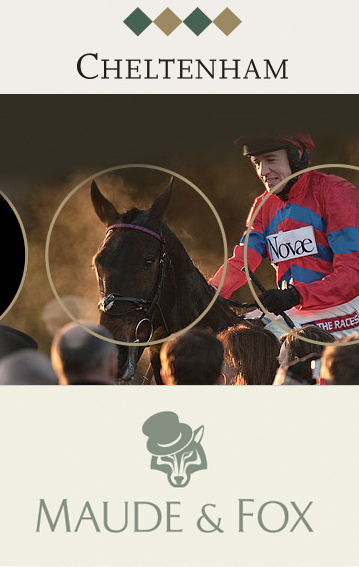 This day is the highlight of the first half of the Jump racing season, featuring the Paddy Power Gold Cup. The Paddy Power Gold Cup has been run every year since 1960 and in that time most of the sport’s greatest names have won the race. The 2012 contest proved to be as exciting as ever, with Al Ferof proving victorious, providing seven-time Champion Trainer Paul Nicholls with his first win in the race in the familiar yellow, red and white colours of John Hales. We’ve been exhibiting at Cheltenham for a few years now. We love the atmosphere here and crowds are always in such good spirits. We will once again be showcasing our range of unique tweed clothing at the ‘Home of Jump Racing’ from Friday the 14th to Sunday 16th November. You can keep warm with a tweed cap, or even treat yourself to a stylish new winter tweed coat. And for those racing fans that like to fly the flag, we will also have our tweed Patriot range on show. Aside from the Paddy Power Gold Cup, there are six other highly competitive and valuable contests on one of the best Saturday cards of the entire season. Gates Open at 10am with the first race at 12.40pm. Tickets are on sale now. For more information please visit www.cheltenham.co.uk. 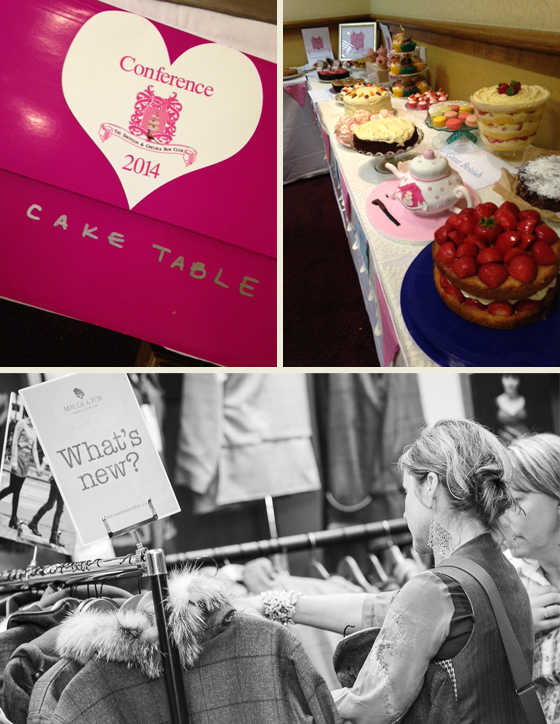 The Maude & Fox team had a fantastic time at last weekend’s Country Life Fair. We loved people’s reactions when first setting sights on our contemporary tweed clothing collection. Setting up Fulham Palace did prove a little challenging so we’re extremely grateful for the wonderful help and support the Country Life Fair porters gave us. We wouldn’t have managed without them! A full report from the weekend with plenty of images will be posted shortly on the Country Life Fair website. Another date for your diaries! The Country Life Fair takes place in the capital during the last weekend in September. The venue for this event is none other than Fulham Palace, the historic home of the Bishops of London. Once enclosed by the longest moat in England, Fulham Palace’s gardens are protected as an important historic landscape. (Keep an eye out for Bishop Compton looking across the lawns from the top of the ‘Bishop’s Tree). Tweed with a twist, Maude & Fox is all about making urban country chic come to life through combining traditional materials, mostly tweed, and great design to make contemporary clothes that can be worn by lad or laird alike. We look forward to exhibiting our latest collection of contemporary tweed clothing, including the Fly Ladies tweed hooded jacket, the Nosy Tweed Parka and the Patriot fleece scarf. In addition to our tweed clothing, The Country Life Fair will feature exhibitors from all over the United Kingdom. You’ll have the chance to sample, taste, try and buy everything from the latest equipment, cars, gadgets, food and wine as well as investigate holidays, spas and property. Tickets can be purchased via www.countrylifefair.co.uk. Use promo code MAF14 when purchasing your tickets and we’ll add your name into the ‘Grand Prize Draw’. The Newbury and District Agricultural Society was formed in 1909 with the aim of providing a show to replace the local Horse Show. Today the Society is a registered charity established who runs one of the most successful agricultural shows in the country – The Royal County of Berkshire Show. Where else can you see everything from chickens to llamas; horse driving to pig showing skills; taste Britain’s finest foods and watch cookery demonstrations; sample the best craft and watch traditional crafts in action or compare your horticultural skills to the expert displays on show? The 2014 Royal County of Berkshire Show takes place on Saturday the 20th and Sunday the 21st of September at the Newbury Showground in Berkshire. Come and watch the best in show jumping, the wonderful spectacle of the Livestock Grand Parade and the breathtaking Hot Air Balloon flight at the end of each day. You’ll also want to pay the Maude & Fox stand a visit (find us on Avenue A) and get your stylish Autumn and Winter wardrobe sorted with our tweed contemporary clothing. 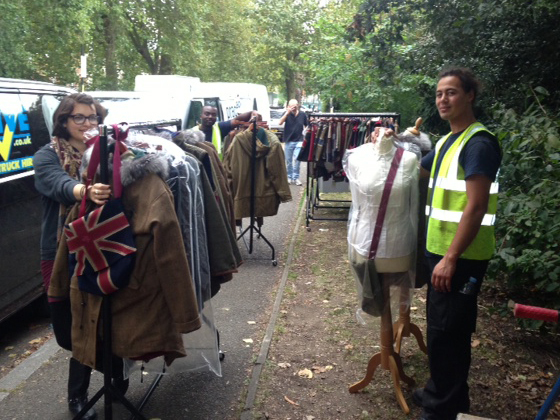 Our latest Nosy Parkas, Fly Fitted Jacket and tweed Patriot range has certainly proved to be a hit at our recent events. Tickets for the Royal County of Berkshire Show can be bought via www.berkshireshow.co.uk. 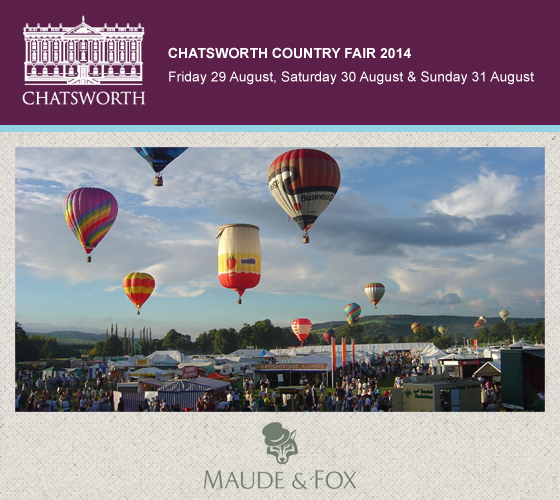 Taking place during the last weekend in August, the 2014 Chatsworth Country Fair is one event you won’t want to miss. The theme for this year’s Grand Ring highlights could be described as ‘thrill and courage’. The Motorcycle Display Team of the Royal Signals, the White Helmets, performing spectacular feats of balance, death defying crossover rides and outstanding acrobatics. The Knights of Arkley will be transforming the Grand Ring into a mediaeval jousting arena of the Middle Ages and as a tribute to the airmen of WW2 there will be a fly past by the Royal Air Force Battle of Britain Memorial Flight. There are also lots of events (and prizes to be won) to take part in yourself, including clay pigeon shooting, archery demonstrations, a family fun dog show, climbing wall, fly casting instruction and even a traditional English fairground to visit. Fans of the BBC2 series Proper Pub Food will be very happy to hear that chef Tom Kerridge will be offering cookery demonstrations. Mary Berry CBE, Lesley Waters and Joe Hunt will also be showcasing their cooking skills along with plenty of talented local chefs. There will be over 200 trade stands at this years event. We are very happy to be returning once more with our range of tweed clothing. Key items from our collection will include our tweed waistcoat, Pom Pom tea cosy, tweed messenger bag, the Nosy Tweed Parka, the Fly Ladies tweed hooded jacket and the Patriot fleece scarf. For more information about the fair visit www.chatsworthcountryfair.co.uk. You can book your tickets online here to avoid the queues. The text on the sign may say that Maude & Fox is ‘proudly made in Dorset’ but that doesn’t mean we don’t get out and about! We’ve been busy in our Dorset studio preparing for the upcoming CLA Game Fair, which takes place at Blenheim Palace (Woodstock, Oxfordshire), from the 18th to the 20th July. Not only will we be running our stand of contemporary tweed clothing (Stand No. D0317) but the Maude & Fox team will also be providing tweed clothing for the daily CLA Fashion Show. Making their event debut will be our tweed waistcoat, Pom Pom tea cosy, tweed messenger bag, the Nosy Tweed Parka, the Fly Ladies tweed hooded jacket and the Patriot fleece scarf. 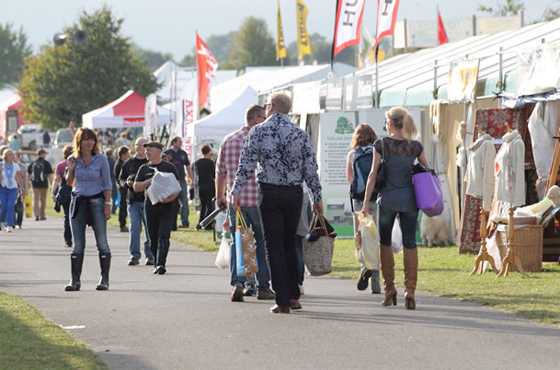 Team member Tanya comments, “The CLA Game Fair is one of the biggest on our social calendar. We had a fabulous time at last year’s event. It’s just as well it runs for three days as there’s so much to see and do! 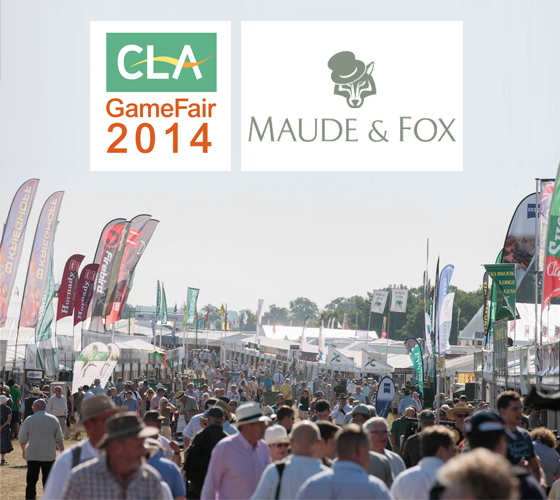 More information on the 2014 CLA Game Fair can be found on our blog here. The CLA Game Fair describes itself as ‘the celebration of the Great British Countryside’ and the team here at Maude & Fox are in total agreement. The CLA Game Fair is held at Blenheim Palace (18-20th July) in Woodstock, Oxfordshire. The CLA Game Fair began life with an informal conversation between two game-rearing specialists more than half a century ago. Nigel Gray and Charles Coles, whilst working at the ICI Game Research Station, put their heads together and came up with a new kind of social event to bring together the shooting and landowning interests of the British countryside. The team at Maude & Fox love exhibiting our collection of contemporary tweed clothing at the CLA Game Fair. This year we will have new items on display including our tweed waistcoat, Pom Pom tea cosy, tweed messenger bag, the Nosy Tweed Parka, the Fly Ladies tweed hooded jacket and the Patriot fleece scarf. You can also see Maude & Fox tweed clothing featuring in the daily CLA fashion show. So if you’re attending this must-see-show, make sure you come by the Maude & Fox stand to say hello. For more information on the CLA Game Fair (and to purchase tickets) visit the CLA Game Fair website. We are excited to announce that very first R&K Stockcraft Open Day will be held this weekend at the Sherrington Shooting Centre near Newport Pagnell. 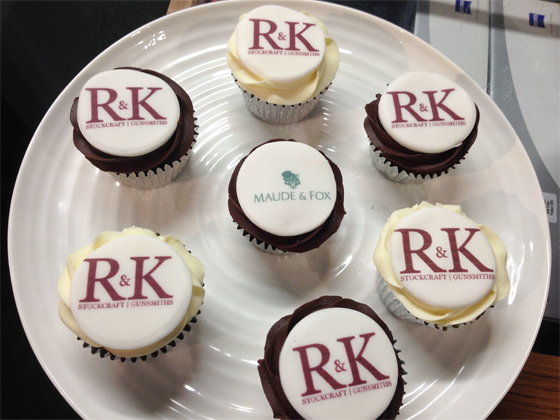 R&K now stock tweed clothing from Maude & Fox with new items arriving in-store this Autumn. You can have a look at at several of our designs at the R&K Stockcraft Open Day, including our Aspen Hoodie and the Henley Gilet. To keep you entertained, as if a 36 bird shoot, a Compak layout, have a go stands, pool shoot, air rifle and rifle layouts are not enough, R&K will also have the Working Dog Company coming along to do some displays. Oh, and they’ll also be music playing from 11am – 1pm and catering throughout the day to satisfy your bacon butty and pig roast needs! If you are attend ending this event then be sure to say hello to Maude & Fox team member Tanya who will be on hand to answer any questions about our range of contemporary tweed clothing. More details about the event can be found on the R&K website. Last Saturday saw The Shotgun & Chelsea Bun Club annual conference take place in Warwickshire. As expected there was a wonderful crowd with over 100 ‘Lady Guns’ in attendance at the conference. 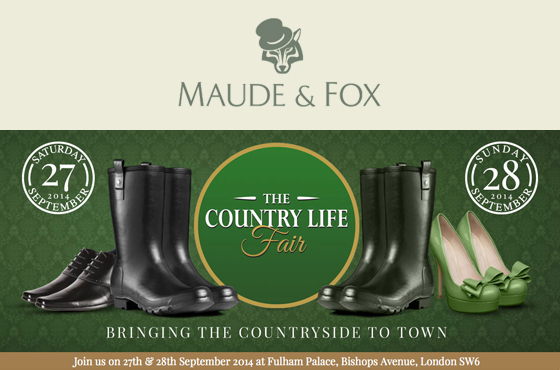 The team from Maude & Fox were once again at the show, taking with them a selection of our ladies’ country clothing. SCBC: “The aim of the S&CBC Conference is to educate and inspire ladies and bring them together, regardless of their ability, age or background. The idea was to put on an event which addressed different aspects of shooting, from law to looking the part, deer stalking to keepering and everything in between, where ladies could get an overarching understanding of all things shooting, in a fun and friendly way. The day proved to be a big success for all those involved with the cake table proving to be a particular highlight for us! Maude & Fox’s MD Sue Longmore commented, “Victoria (SCBC ‘Haed Girl’) has done an amazing job in the last couple of years with the Shotgun & Chelsea Bun Club. Victoria hosted another fantastic conference and we look forward to working with The Shotgun & Chelsea Gun Club for many more years to come”. You can find out more about the 2014 Shotgun & Chelsea Bun Club conference here, or view our range of contemporary tweed ladies clothing collection here.